With the hope of providing quality Catholic education and the ease of transfer of knowledge to students, Sto. Tomas de Villanueva Parochial School invests once again in improving the quality of classroom instruction through the use of some educational technology. Eight subject areas are provided with extension cord, LCD projector, and audio speakers for powerpoint, audio and video presentations of teachers during their classes. 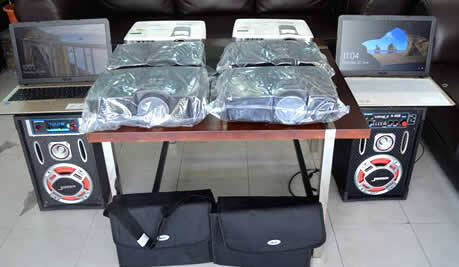 Furthermore, some teachers were provided a laptop loan facility to aid their research and instruction. The school is hoping to increase the level of students’ proficiency as they aim to reach the maxims of their intellectual potentials. Sto. 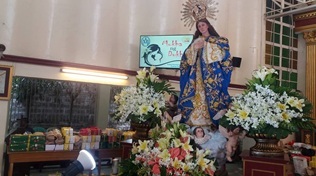 Tomas de Villanueva Parochial School opens classes with a simple dedication of the school year to Our Lady of Fatima as it celebrates the centennial year of the apparition of our Lady to three children. Headed by the Dr. Leo B. Galve, School Director, prayer representatives from grade school, junior high school and faculty were assigned to lead the community. After the singing of the Philippine National Anthem, Dr. Leo B. Galve welcomed the old and new students who enrolled for the current school year. He also thanked the parents for their support to their children during the first day of classes. 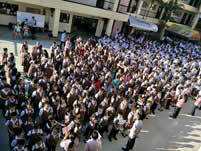 Moreover, Dr. Marcella D. Bejado, the 7th School Principal was also introduced. She took office last April 1, 2017 replacing Sr. Rosalie P. Regencia, OP. She is the concurrent School Principal of Sto. Niño Parish School in Pasig Greenpark. Dr. Marcella D. Bejado shared her message in line with the solemnity of the most Holy Trinity. Three may be illustrated as a triangle which when reversed forms a heart. She said that the school community shall share their HEART. H stands for Help to which we should extend to one another; E stands for Excellence to which the school should nurture; A stands for Act to which all stakeholders are expected to do their share to improve the school; R stands for Respect to which students should accord everyone. T stands for thanksgiving to which we should always be thanking God for all His blessings. The simple rite ended with closing prayer led by Dr. Leo B. Galve who announced that the regular Sunday Eucharistic Celebration shall commence come June 18, 2017 with teachers to sponsor and offer during the Mass. The feast of The Immaculate Conception of Mary was celebrated by Sto. Tomas de Villanueva Parochial School last December 8, 2016. Grade three pupils from Santolan Elementary School together with their advisers were invited at the STV Parish to hear the Mass and to celebrate the cake festival with the STVPS community. The Mass was led by Fr. Darwin Calderon, school’s Chaplain. Students and teachers offered cakes to the Blessed Virgin Mary. After the Mass, the simple Marian Concert started with the theme “Mukha ng Dukha.” It was led by Mr. Christian Santos, Collegiality and Friendship Officer of STVPS. The performers were teachers and students from the school, the school’s Director, Principal and PAC Officers also performed. When the concert ended, the cakes that were offered were brought to the school to be given to the guest Grade 3 pupils and teachers from SES. It was distributed with the help of the STVPS’ SSG officers and teachers. The rest of the cakes were given to different schools around Santolan, Pasig. English Week is celebrated annually in the school where students are showcasing different talents and skills that are continuously developing and improving. Last second week of November, the English teachers both elementary and junior high, conducted their elimination round of the Spelling Bee per grade level; and they chose the Best in Spelling. 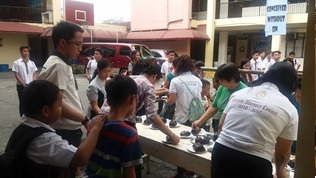 Another activity conducted was the exhibit of Grades 7 and 8 that was held in their classrooms. The said exhibit of Grade 7 focused on the Evolution of Philippine Literature which are from Pre-Colonial Era, Spanish Era, and Modern or Contemporary Era. The Grade 8 exhibit was about the literatures of China, Japan, and Korea, as part of the Afro-Asian Literature. The Grade 9 was a contest on Bulletin Board Making and the Grade 10 was on Photojournalism with both the theme “Graduate Attributes in Action Leading to Social Transformation”. These activities were judged last November 25, 2016 by Sr. Rosalie P. Regencia, OP, school principal; Mrs. Helen H. Aquino, HR and AP Coordinator; Mr. Christian B. Santos, CFO; Mr. Joseph S. Cruz, Science Coordinator; and Mr. Great Allan M. Ong, TLE/Computer Coordinator. The last activity was the Literary Quiz Bee with members from Grades 4 to 10 each group. It happened last November 29, 2016 at the Computer Laboratory, at 3 o’clock in the afternoon and ended at 4 o’ clock in the afternoon. It was hosted by Ms. Joy Anne R. Puazo. September 1, 2016 – Festivities ran high in STVPS as the students showed their pride for their respective teams. Red Stallions and Green Eagles’ banners were plastered on the grade school and high school buildings. The excitement can be felt through the morning air as one of the most anticipated parts of a student’s high school life was nearing in. The program started at 7:30 in the morning with the hosts Mr. Ron John Villaseñor and Ms. Joy Anne Puazo. Before the program started was the announcement and launching of the 50th Anniversary concert of STVPS. The “Little Mr. and Ms. STVPS” had their introduction and catwalk, following the order of appearance by Red Stallions, Yellow Cubs, Green Eagles, Blue Spartans and the last but not the least, the Black Phoenix. After the “Little Mr. and Ms. STVPS” were done with their catwalk and introduction, the High School counterpart were up next and were introduced in the same order of the Little Mr. and Ms. The judges for the sportswear were also introduced which include Mr. Great Allan Ong, Sr. Rosalie P. Regencia, Mr. Eleazar Pada, Mr. Joel Yacap and Ms. Angelica Pearl Recio. At 8:00 to 8:10 a.m., the “Little Mr. and Ms.” had their sportswear competition in the same order with the Red Stallions as the first and Black Phoenix the last. Up next were the “Mr. and Ms. STVPS” showcasing their sportswear lasted for another 10 minutes. After the competition, a short break was provided to prepare athletes for the first game of the intramurals. The first game of Basketball Girls was the Red Stallions against Green Eagles. Sr. Rosalie held the ceremonial toss. Green Eagles got the head start being the first to get the ball and scored the first point for the game. The Red Stallions caught ahead with scoring two more points and dominated the first half of the game, Red with the score of 6 and Green with the score of 2.The game ended with the Red Stallions as the winner for the total score of 12 against the Green Eagles’ 8 points. Some honorable mentions of players who scored the most for their respective teams were Fernandez and Morales of Red Stallions and Garcia and Ramos for Green Eagles. Up next was the Basketball Boys of Red Stallions against Green Eagles. Mr. Gaspar of the Red Stallions and Mr. De Guzman of the Green Eagles were assigned as Ball Captains. Mr. Leo Galve held the ceremonial toss. The game started at 9:20. The first point was earned by Green Eagles but the first set of the game was in favor of the Red Stallions with a score of 18 and 12. The second set of the game favored Green Eagles with a score of 28 against 22 of the Red. The third and fourth sets of the game were dominated by the Red Stallions. Red Stallions caught up in the third set dominating with a score of 45 and 30 of the Green. Almost at the end of the fourth quarter, the Reds scored 56 against the score of 53 by the Greens. Should the three-point shot been released by Mr. Viscayno before the buzzer, the game could have been extended. Red Stallions bagged the first place in both boys’ and girls’ basketball. Special citation was awarded to players who scored the most. Mr. Viscayno and Mr. De Guzman scored high for the Green Eagles and Mr. Gaspar and Mr. Labicane for the Red Stallions.